Welcome! 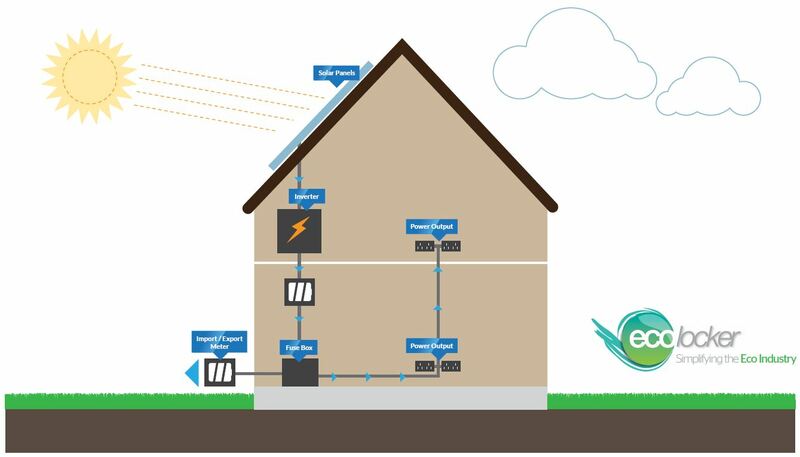 In the video below you can get an animated and simplified look at how solar panels convert sunlight into usable electricity, to learn in more debth read below. Light from the sun travels 93 million miles before it gets to earth. Sunlight lands on your roof and is magically transformed into electricity. The generated power works your TV, heats water and lights your way at night. The key to this modern miracle is the photovoltaic cell that takes that renewable energy and sustainable supply and generates electricity. Of course, there’s more to it than that. Let’s start with the basic components of your average solar panel system – the sort you see on the roof of a house or out in the country as part of a solar farm. The main constituent of an effective solar power system is the photovoltaic cell. Photovoltaics has been around for a good few years now. Back in the late 1950s PV cells were almost exclusively used to power things like satellites. And many of us remember having calculators at school that didn’t need a battery because they were powered by the sun. The desire to harness that energy has been the Holy Grail of renewables for the last 30 to 40 years. The great thing about solar cells is that they don’t need bright sunshine to work. They just require light and can produce electricity even on a cloudy day – which is great news here in the UK. 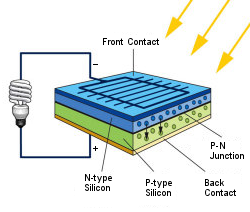 There are several types of photovoltaic cell used in solar panels. They are made from silicon, an excellent semi-conductor. These different cells vary in the efficiency of their electricity production, their purity and their cost. Put simply, the cells absorb the light from the sun and convert it to electricity. By placing a connection either end of the cell you can then collect that current and use it to power all your energy needs. Find out more about the different types of photovoltaic cells. The photovoltaic cells are bunched together into modules that make up a panel. In a typical solar panel, you will have two thin layers of silicon that have been treated in slightly different ways. The top layer, facing the sun, has atoms that are unstable so that when an energy source hits them, electrons fly off. The lower layer has a number of ‘gaps’ in the atoms that are in dire need of an electron or two. What happens when sunlight hits the top layer is that the unstable electrons get excited and are attracted down to the bottom layer. This movement of electrons causes a current. If you add two metal contacts above and below, you have a circuit and a system that produces electricity. We are all familiar with the glass style solar panels we see on roofs around town. There are a number of different varieties now available, including ones that look like normal tiles. Find out more about the different types of solar panels on the specific page dedicated to this answer. The current created in the solar panels by the excitation of electrons is called direct current or DC current. DC electricity is not suitable for running our household appliances or feeding into the National Grid. To be of any use at all, a conversion to AC electricity or alternating current is necessary. For this you need a box called an inverter. This usually sits outside your panel array, somewhere like the attic. The DC current enters it and emerges as AC and can be fed into your house. More on inverters here. If you are thinking of having a solar PV system installed, then there are a number of considerations to make that will have an effect on the efficiency of electricity production including the location and type of array. Efficiency of the photovoltaic cells: There are different types of cell that produce more or less energy depending on their size, thickness and purity. The purer kind tend to be more efficient and hence more expensive. A South facing roof: To get the optimum energy production you need a South facing roof. This will ensure the panels catch more of the direct sunshine. Potential shade: Do you have trees surrounding your roof? Then you need to consider how much it will be in shade over the summer months. An oak tree may seem fine in winter when the branches are bare, but when it is in full bloom that may have an adverse effect on the amount of electricity you can produce. Roof angle: Most installers of solar panels recommend an inclination of between 22 and 75 degrees to get the most out of the sunlight. The ideal angle will also depend where in the UK your house located. For a house in London the ideal roof or solar panel array angle is 51 degrees, while in Aberdeen that is 57. There are also changes throughout the seasons. You may want to consider a solar panel installation that can be adjusted. Adjustable panels will get the optimum amount of sunshine. Size and number of panels: Of course, you will need to have enough room on your roof to cope with the right number of panels. There will need to be enough to provide all your energy needs. You will want to be able to produce a surplus for selling onto the National Grid. As a rule, higher purity, more expensive photovoltaic cells need less space than cheaper alternatives. It’s a question of getting the right balance between cost and efficiency and the space you must devote to the installation. There are several things you must think about when getting solar panels installed. That’s why it’s always a good idea to get some advice from the experts. Check out our database of reputable installers who can assess your property and come up with the right solutions for your energy needs.